the cells crave for more glucose – so they tell our brain to feed them, due to these triggers in our brain, we eat and eat. We gain weight, and then ultimately feel stressed about that weight gain and the vicious circle begins and repeats itself over and over again! 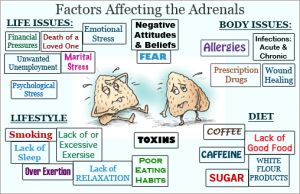 Here is how we can brake this cycle: Get on an Adrenal Fatigue Diet Plan and keep it up for 21 days without cheating! After these 21 days your body will have changed it’s cravings for foods and automatically will crave the “good stuff”. That’s the easy step. Number two is the harder step which is to keep stress away from you, learn to relax. Many times certain things that create stress can not be changed for many reasons so think about it twice and do not let it get to you. If you do first the situation that caused stress will not change and second you make yourself literally sick and “fat”! So stop stressing about Problems and start searching for solutions. As a friend once said to me there are no problems just solutions! 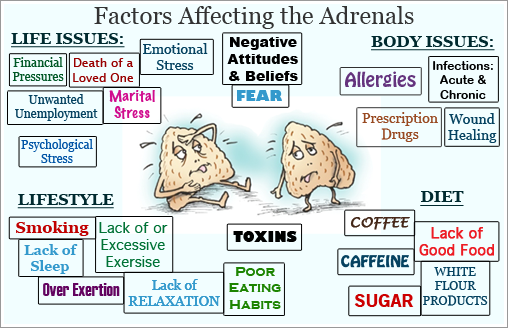 If you need help to jump start your Adrenal Fatigue Diet Plan and recovery journey for better health and weight loss please contact us. We have great online classes which can help you make Lifestyle changes and which you can do from the comfort of your home whenever you find time. We will coach you through your journey to a better you!